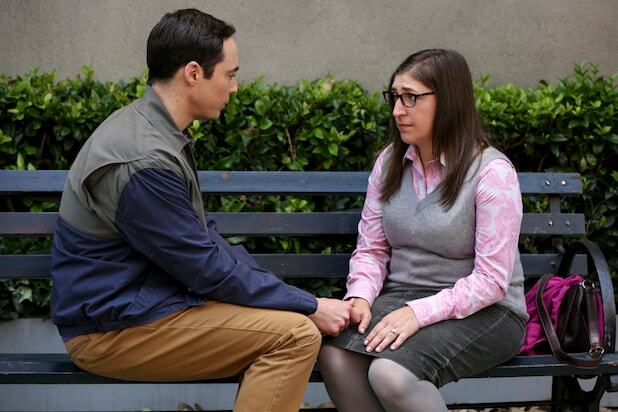 "The Conjugal Configuration" - Pictured: Sheldon Cooper (Jim Parsons) and Amy Farrah Fowler (Mayim Bialik). Sheldon and Amy's honeymoon runs aground in New York, while Penny and Leonard discover they are uncomfortably similar to Amy's parents, Mr. and Mrs. Fowler (Teller and Kathy Bates). Also, Koothrappali insults physicist Neil deGrasse Tyson and starts a Twitter war, on the 12th season premiere of THE BIG BANG THEORY, on a special night, Monday, Sept. 24 (8:00-8:30 PM, ET/PT) on the CBS Television Network. Photo: Michael Yarish/Warner Bros. Entertainment Inc. ÃÂ© 2018 WBEI. All rights reserved. Monday night was the official start to the 2018-19 TV season, and NBC emerged victorious with “The Voice” and its series debut of “Manifest.” CBS finished primetime as the ratings runner-up, despite “The Big Bang Theory” dropping hard from last season’s huge premiere, which was boosted by a Sheldon and Amy wedding-proposal cliffhanger. As you might expect, broadcast primetime was filled was season and series premieres. For CBS, the “Magnum P.I.” reboot debuted between the new season premieres for “Young Sheldon” and “Bull.” For ABC, it was “Dancing With the Stars” and “The Good Doctor” kicking off their new runs. Fox’s “The Resident” also returned on Monday, serving as lead-in for a new “9-1-1” episode. That latter drama initially came back to the small screen on Sunday. NBC was first in ratings with a 2.1 rating/8 share in the advertiser-coveted 18-49 demographic and in total viewers with an average of 9.8 million, according to preliminary numbers. “The Voice” from 8-10 p.m. posted a 2.0/8 and 9.6 million viewers. “Manifest” at 10 earned a 2.2/9 and 10.3 million viewers, tying as TV’s top-rated drama debut since “This Is Us” in 2015. CBS was second in ratings with a 1.4/5 and in viewers with 9 million. “The Big Bang Theory” at 8 received a 2.4/10 and 12.7 million viewers. The “Young Sheldon” Season 2 premiere at 8:30 put up a 1.7/7 and 10.5 million viewers. “Magnum P.I.” at 9 had a 1.2/4 and 8.1 million viewers. At 10, “Bull” got a 0.9/4 and 7.3 million viewers. Fox was third in ratings with a 1.3/5 and third in viewers with 5.7 million. “The Resident” at 8 returned to a 1.1/5 and 4.8 million viewers. Ryan Murphy’s “9-1-1” at 9 had a 1.6/6 and 6.6 million viewers. ABC was fourth in ratings with a 1.2/5 and third in viewers with 8 million. The “Dancing With the Stars” season premiere from 8-10 averaged a 1.1/4 and 8.1 million viewers. “The Good Doctor” at 10 got a 1.4/6 and 7.8 million viewers. Telemundo was fifth in ratings with a 0.6/3 and in viewers with 1.6 million. Univision was sixth in ratings with a 0.4/2 and in viewers with 1.3 million. The CW was seventh in ratings with a 0.2/1 and in viewers with 780,000. “Penn & Teller: Fool Us” at 8 settled for a 0.2/1 and 901,000 viewers. At 9, “Whose Line Is It Anyway?” managed a 0.2/1 and 699,000 viewers. A rerun followed.